What could a Data Driven Business mean for your company? Data, Data, Data – companies gather, collect, evaluate and reutilise data no matter where you look. This is common knowledge, as is the fact that a successful Data Driven Business enables new business models while simultaneously supporting traditional business. Companies require a more stringent approach in order to successfully capitalise on the opportunities provided by increasing digitalisation. The Exploded View invented by Jonathan Möller is a remedy. More about the Exploded View can be found here. “Collecting, processing and applying data; a Data Driven Business is becoming increasingly important to companies”, CEO Jens Plattfaut says during our three-way discussion together with Senior Data Scientist Kilian Semmelmann at the Munich office of foryouandyourcustomers. “Handling the growing flood of data to the best of its advantage benefits any organisation, regardless of its size and industry, by revealing potential optimisations, encouraging improvements to processes and allowing new products and services to emerge while also requiring new capabilities and skills”, says Plattfaut. “Then the internet and channels such as websites, online shops and mobile apps, to name just a few milestones, initiated a change”, Jens Plattfaut continues. A change of such an extent that companies had to master an increasing diversity in the form of channels through which a company communicates, offers services and sells products. This also included growing customer requirements, new services and other competitors. Once it has reached this level of development, a company has an increasing number of points of contact to the customer as well as to other companies, meaning they are no longer merely dealing with one-way communication. “Take the lawnmower, as an example,” Kilian Semmelmann explains. Let’s say a company successfully manufactures lawn mowers. To begin with, these mowers are sold exclusively in their own store, yet with the advent of the internet the company begins to also sell their product through their own online store, or possibly even through distributors’ online platforms. In order to be able to provide the customer with a good experience, the products must now be presented while featuring their properties, availability, any necessary additional information and so on, all while being appealing and free from errors. In the best-case scenario, the customer will place an order for a lawn mower at the end of their evaluation process, thereby triggering a process that culminates in the customer receiving their goods which they ordered through their selected channel and at a time and location of their choosing. A company must first have its own online shop in order for this process to be triggered. This shop must be maintained by an employee skilled in eCommerce. The sales, marketing and production departments expect up-to-date data on products and customers. Orders must be administrated as product data and initiate the process from the warehouse to the customer. Add to this the fact that a vast amount of data is no longer required by just the company alone, but also by distributors, suppliers and partner companies, who in turn supply data to the company in regard to demand, sales and customer feedback. Expanding traditional businesses and the opportunities presented by the internet have provided companies with a multitude of new opportunities: addressing a greater number of customers, intensifying customer relationships, utilising new customers and customer groups and selling products across a diverse range of channels. Setting up internal procedures and processes in a smooth and faultless manner simultaneously requires new skills, capabilities and roles within an organisation, in particular when it comes to the handling of data. “Over recent years, technological developments related to the Internet of Things (IoT), and with digital twins and artificial intelligence (AI) in the course thereof, have elevated the usable potential for companies to a completely new level, along with the challenges said companies face”, Kilian Semmelmann continues. Entirely new branches of business have emerged, such as the transport service Uber or the online supermarket Picnic, whose business is driven by data and primarily operated through the mobile app channel. “Picnic is one company in particular that carries Data Driven Business in its DNA, and where the use of AI, digital twins and machine learning form the basis of that company’s success”, says Jens Plattfaut. A digital twin refers to a virtual replica of a person or product held by a company. This digital twin is created as soon as a user has logged in to a website or a mobile app. “Picnic succeeds in maintaining all the necessary data on every individual customer as a digital twin entity while keeping it up to date. They know the product lists of every single Picnicer from their very first purchase, they can provide data-based suggestions for the customer’s next grocery shop and calculate how often they go shopping and what they reorder in which quantity”, reports Jens Plattfaut. In the meantime, there are a multitude of companies who expand their business using these new opportunities or by applying the ensuing knowledge to traditional areas of business. “Let’s have another look at our lawn mower example”, says Kilian Semmelmann. “The relationship between the manufacturer and the customer is enhanced through the use of IoT-enabled lawn mowers” – or, in other words: it becomes more personalised. Equipped with this technology, the lawn mower is able to report information regarding the condition of its blades, the frequency and duration of its use, the characteristics of a particular lawn or the condition of the mower’s accessories directly to the manufacturer. Every customer’s lawn mower is therefore recorded and maintained as a digital twin. This generates data which enables the company to initiate automated processes using artificial intelligence and machine learning through which each individual customer can be targeted with communication, offers and services via mobile app. Useful conclusions can also be drawn in regard to the product, which in turn can be incorporated into various internal processes. “This form of intelligence will encompass more and more business units in future and in various manifestations. Knowing how to deal with this intelligence, how to utilise this flood of data and how to apply it to other business areas is crucial to success”, Jens Plattfaut is convinced. 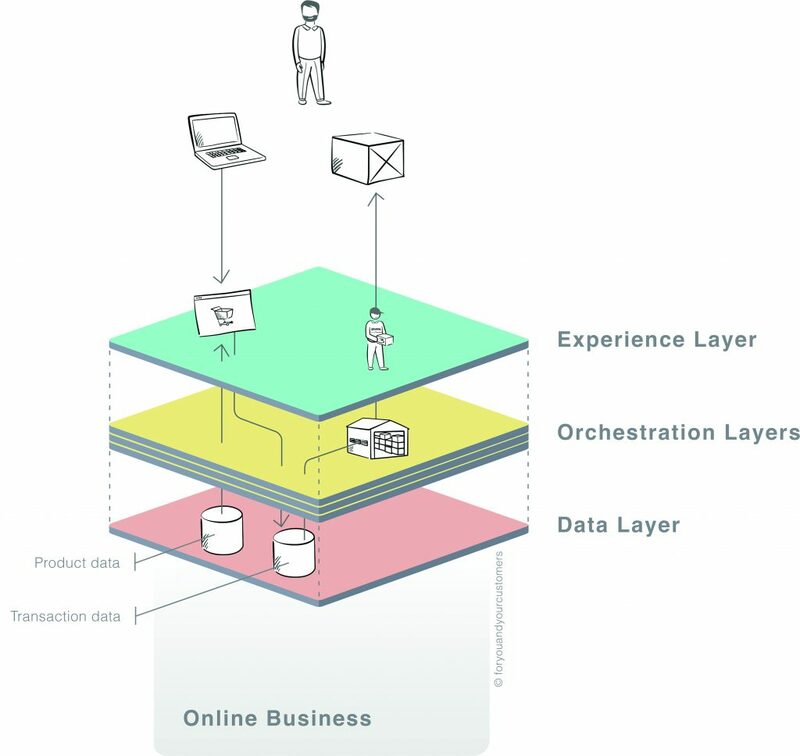 “The first question that customers often ask us is ‘how should I approach a successful Data Driven Business?’ This requires a stringent approach for which we use the Exploded View in order to work our way to the top according to our ‘data science first’ principle and by analysing current conditions layer by layer together with the customer, their customers and their experiences. Our experience through various projects has demonstrated that the internal challenges to do so tend to shift towards the bottom in the direction of the Data Layer. They must be created by companies through new employees, new departments, new systems, etc. – in other words, through new capabilities and skills. 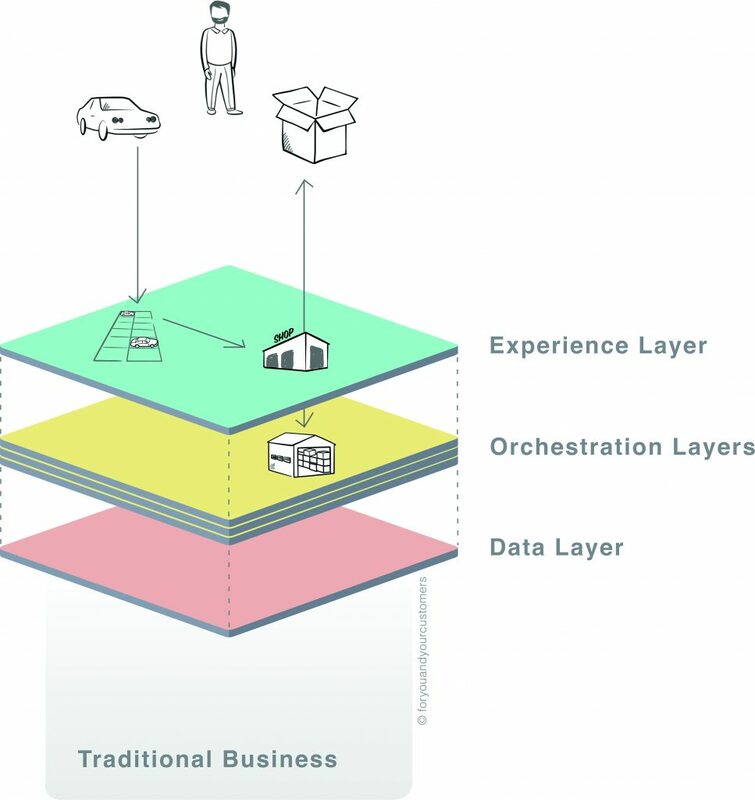 After all, in order to have a successful Data Driven Business a company requires the necessary maturity so that all business-relevant data are available at the right time, in the right form and in the right location to carry out the desired processes”, explains Plattfaut with regard to the six-layer model. 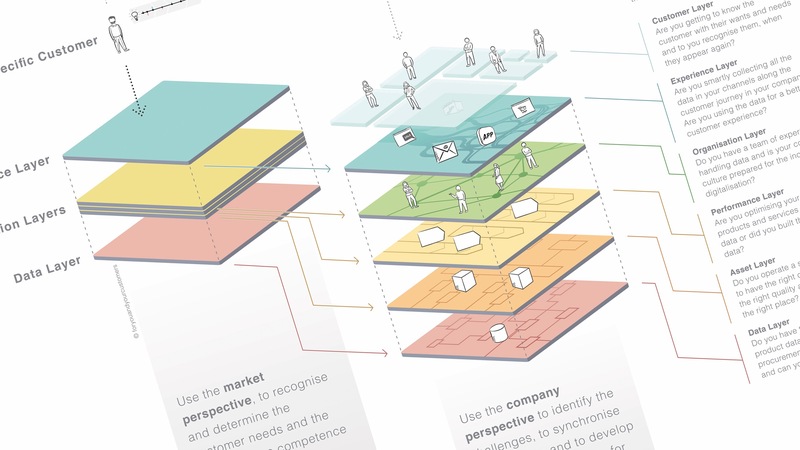 By applying a suitable model, an organisation can first examine and subsequently guarantee that each layer ultimately possesses this level of maturity, guaranteeing the smooth interlocking of the overall processes in a modular structure. “The lawn mower example has illustrated that the IoT-operated device of a company with a corresponding setup is capable of transferring a wealth of data to the manufacturer in a useful manner without the loss of data”. This information is gathered into various pots of data on various customers and customer groups, on products and transactions and combinations thereof, for example in the form of transaction data and data pertaining to visits. The respective information is subsequently transferred back to the customer across all company layers. “This process would not be able to work without an existing system landscape, nor would it function without semi-automated or fully- automated processes. They are necessary components of a Data Driven Business which would be unmanageable in a purely manual form”, Jens Plattfaut explains. 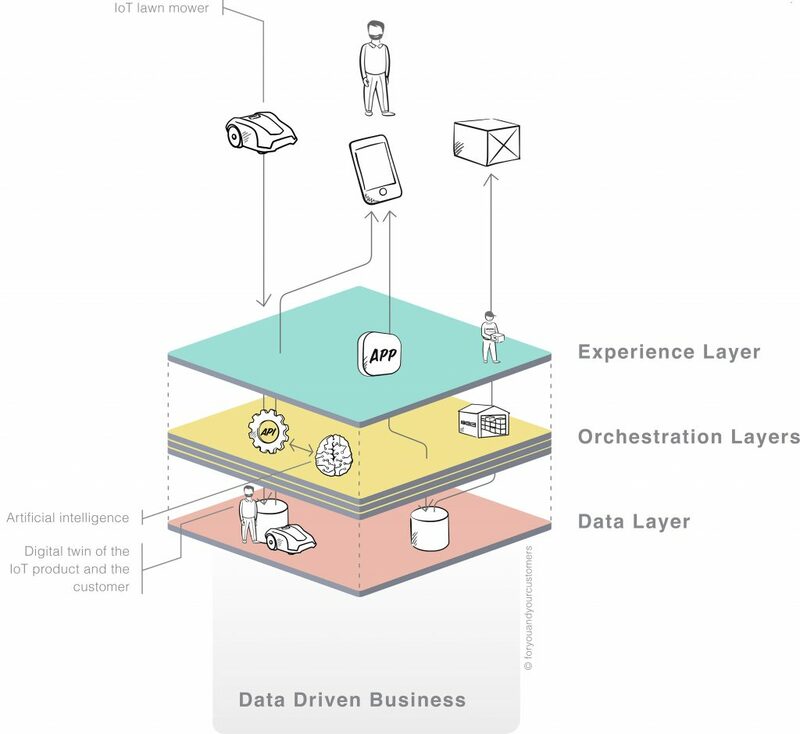 Regardless of whether one runs a traditional or eCommerce business or whether one uses digital twins or IoT devices, gathered data can only be utilised and tapped into through the appropriate systems by providing the data to the Performance Layer. After all, a company’s purchasers and its vendors require reports on sales figures and available stock, the eCommerce team needs up-to-date product information in order to maintain the online shop while the mobile team guarantees the smooth transmission of information through the mobile app of the owner of an IoT lawn mower. Every step of the procedure, both in itself and in its successful interaction, is an aspect which is relevant to success in order to provide the customer with the best possible customer experience with a company. “A prosperous Data Driven Business inherently requires cultural change within an organisation”, Jens Plattfaut explains in conclusion. “It is therefore vital for a company to adapt internally to these changes”. Employees must recognise the potential that presents itself to the company through the sensible treatment of data. They must comprehend that data help improve work processes while facilitating decision-making. Furthermore, they must also understand that a Data Driven Business is only feasible through semi or fully-automated processes in the present day, which eliminates the need for repetitive tasks while freeing up staff members’ time and energy, so it can be used in a way that is of more sense and use to the entire organisation. “This applies to exclusively data-driven companies, but also to the supermarket around the corner”.